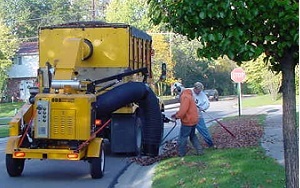 The Public Works department performs leaf collection in the fall season as leaves begin to fall. This is a free service that is available to residents. We ask that residents rake leaves into piles or rows along the curb line. Please do not bag the leaves. To better help crews, please do not park in front of or near the leaf piles between the hours of 7:00 AM and 3:30 PM Monday through Friday to ensure that your leaves are collected. Residents are advised to NOT place leaves in the street. During rain events, storm sewers may become blocked by leaves causing localized flooding on streets. Not placing leaves in the street also helps with water quality in the streams. Unfortunately, yard waste debris like grasses and grass clippings can not be picked up by the City. Please place these items in bags and set them out for the trash to be removed by the trash hauler. Leaf collection begins in October and the last day residents can bring leaves to the curb is December 2, 2018. This allows crews to cleanup existing leaves already placed curbside and still have time to prep the trucks and equipment for the upcoming winter weather season. Collection begins on the Westside of Route 4 and moves to the Eastside the following week.